Cameroon links West Africa with the continent's centre and is sometimes called Africa in miniature, because of its great geographical and cultural variety. Cameroon Travel and Tourist Information with links to official travel and tourism websites and state resources for visitors to Cameroon. Around Cameroon, Cameroon Country Information, Cameroon News, Cameroon Travel Tips, Cheap Hotels and Hostels in Cameroon, Douala, Map of Cameroon, Yaounde. Countries neighbouring Cameroon are: Nigeria, Chad, Central African Republic, Republic of Congo, Gabon and Equatorial Guinea. A coastal plain with dense equatorial rainforests occupy the south of Cameroon. The Portuguese explored the coast in the late 15th century and called the estuary to the south of Mount Cameroon the river of prawns, or rather Rio dos Cameroes. From 1961 until June 2nd, 1972 Cameroon was a federation of the former French Cameroons in the east, and the former British Cameroons in the west. English and French are both official languages; although French is the more widely spoken, while English is restricted to the west. The native language in the south is Bantu, while the tongue of the north is more Sudanic. The capital of Cameroon was founded in 1888, under the German colonial administration. Find hotels in Cameroon with special online rates. Hilton Yaounde - Boulevard du 20 Mai, Yaounde, Cameroon. 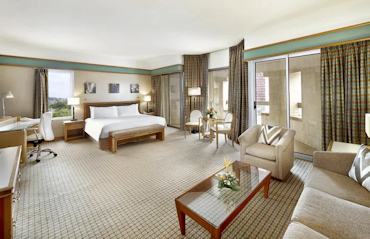 Well known for its high level of security, personal service, and excellent cuisine, the Yaounde Hilton has become the meeting place for businessmen, government officials, and international organisation missionaries. Guests at the Hilton Yaounde enjoyed the clean rooms, excellent service and great location. 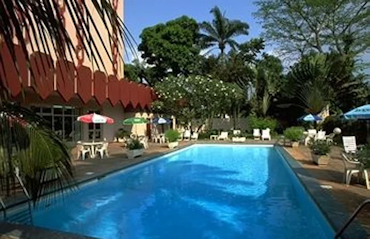 Compare Hotel Prices in Yaounde. Before the outbreak of World War I, the Germans initiated road-building in Cameroon and began the construction of a railway at the port of Douala, on the Atlantic coast. Ibis Douala - Rue Pierre Loti, Bonanjo, Douala, Cameroon. Situated in the heart of Banajo business centre, the Ibis Douala is a modern, superior tourist class hotel with free fenced parking, restaurant, bar and swimming pool. There's also a free shuttle to the airport - 7km away. Guests at the Ibis Douala rated the clean rooms, excellent service and great location. Adamawa Massif is a plateau region in the centre of Cameroon, with elevations over 1,000 metres above sea level. In the north of Cameroon, forest gives way to savannah, and changes to marshland around Lake Chad. The west of Cameroon is high, forested mountains of volcanic origin, with Mount Cameroon, an active volcano and the highest peak in western Africa; at 4,095 m.
Bamenda is the provincial capital of Cameroon's North West Province and is a popular area for hiking. What's happening in Cameroon today. Daily news from Cameroon; in French. Cameroon Travel Guides - Cameroon Maps.